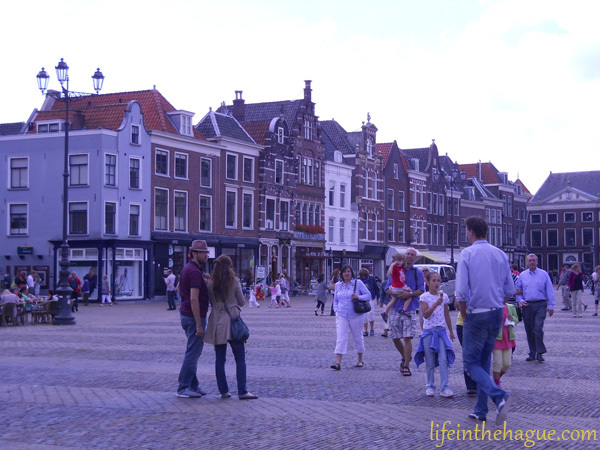 A few weeks ago, Marco and I went to Ikea in Delft to see if we could buy a bookshelf for me. I originally wanted the narrow, but tall version, in dark wood – but it was way too heavy to carry back on the tram. So we settled for the shorter version which still stores a fair amount. 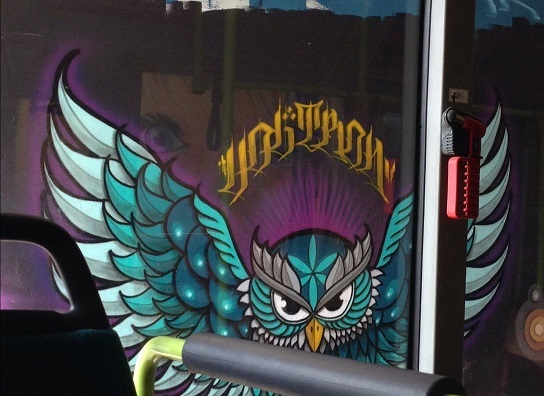 I’ll leave you with a few pictures of graffiti that I took on the ride over to Ikea. 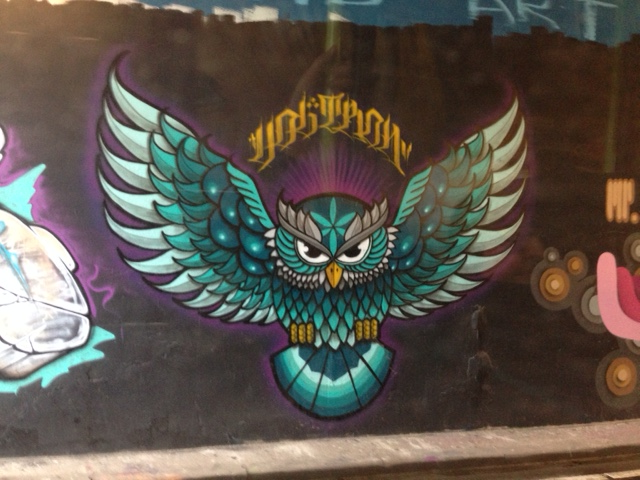 The owl has already made an appearance on this blog, but this picture is a bit better. The other is new. 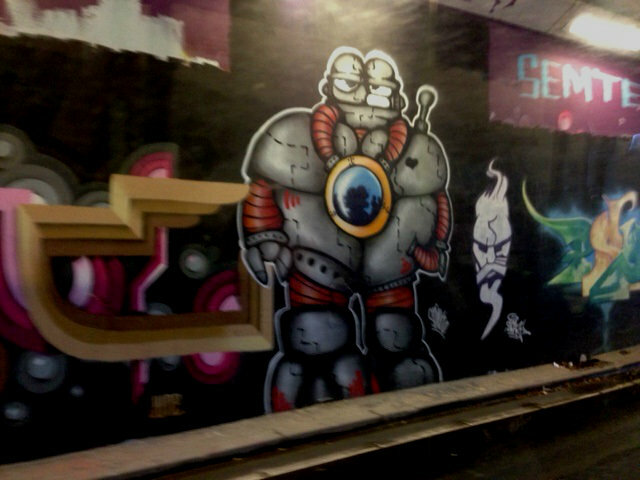 The graffiti is always more interesting on this side of the pond! Last month or so Marco and I went to Ikea in Delft to look for some random supplies. We ended up purchasing funnels for the kitchen (random) and reading lights for the bedroom (intended). 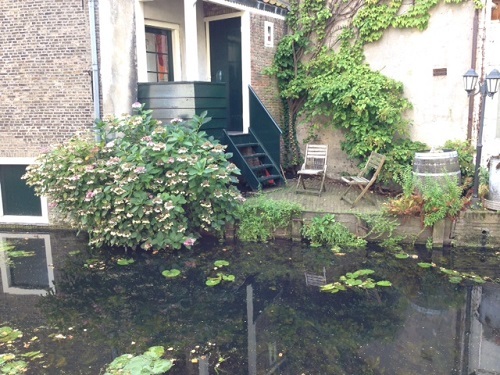 It was a nice day to walk through Delft – still jacket weather, but warm enough. Relaxing. Almost at the end! Next week is the big test. We spent about an hour going over what what would be on it. The problem is that we are slightly behind (4 more sections to go) so she had to quickly cover what was on the test that we hadn’t learned yet. “Study this exercise! Study that exercise!” and similar. It was a bit of whirlwind. The class sized remained about the same – maybe 10 people or so. While the teacher was pretty helpful about what to study, it also included broader things such as “study all of the chapter summaries” or “study all of the grammar exercises in the workbook”. Not a big deal, though. This class also had some little things that I didn’t know. Like “wat” is the same as “iets” (something). It doesn’t literally translate well to English – I wish (really) a new tv want (? yikes). But in English it is: I (really) want a new tv. I (really) wish that my test is easy. This one translates a bit better to English, except that “is” moves to the end because that part of the sentence (my test is easy) is a sub clause. 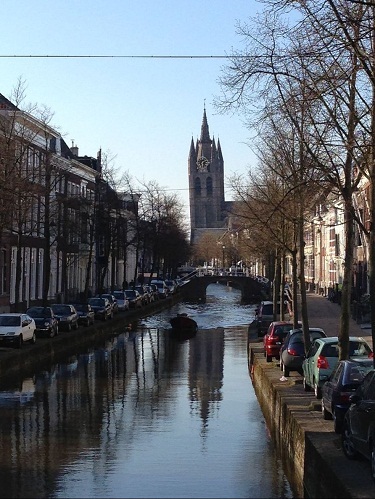 The leaning Oude Kerk (old church) in Delft, which we visited with friends. Look at it lean! My fridge is full of lots of little trinkets, including but not limited to Dutch things. 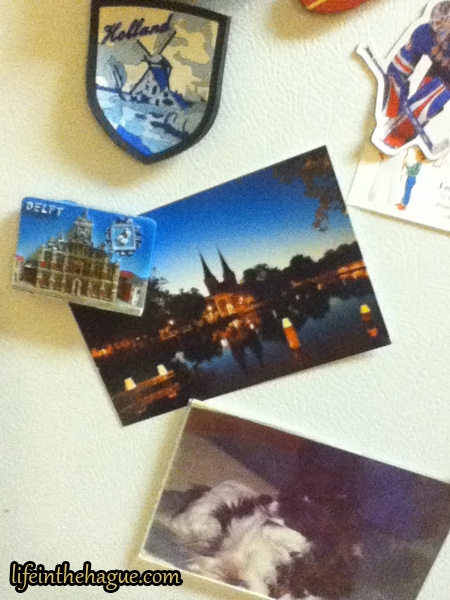 There’s a Holland magnet above that which Marco gave me a long time ago. Due to its age, it’s starting to bend a little bit. In the upper right you can see part of a magnet for the New York Rangers goalie, Henrik Lundqvist (Let’s go Rangers!). 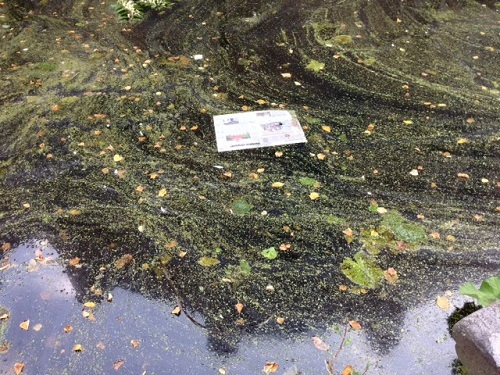 It’s actually holding up a business card with information regarding my next dental appointment in late November. And this is only one corner of the fridge! I plan on taking most of these with (if we find a not-so-garish way to display them) – and if they survive being peeled off. Some don’t respond well to being moved anymore. 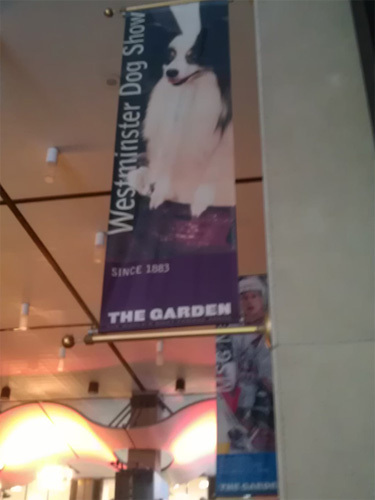 Above is a picture of the Westminster dog show banner in the Madison Square Garden. It features the papillon “Kirby” which won in 1999. During the dog show (which happens during the hockey season), the ice rink must be melted down. Otherwise the dogs can sense the ice and spend most of their time trying to dig down to get at it! My random purchase of the day was pork loin chops. I have never cooked those before, so it should be interesting, though I might wait and have them for dinner tomorrow. Thankfully I never get much due to having to carry it all on the walk home, so I could go into the express lanes. The person in front of me was trying to buy a single can of beer, and it was ringing through as if it were from a 6-pack even though the person got it from a cooler. This reminded me of shopping at Albert Heijn in the Hague. You are allowed to pull an item from its pack (say a 6 pack of beer) and pay for it separately without the cashier batting an eyelash. That is a foreign concept over here! Today’s picture comes from the Oude Kerk in Delft. Another stained glass window. It amuses me how it is called “Old Church” and yet it looks so vibrant and new, especially compared to the Nieuwe Kerk (New Church). Perhaps it is the white walls and the bright, welcoming atmosphere. Het is vrijdag. I say that a lot, but I do mean it. Of course there’s a fairly small chance I might have to go in tomorrow as well – but it’s quite unlikely. Here’s hoping my phone doesn’t ring! I can’t say much about today except that my brain has effectively turned off at this point. About all I have managed to do tonight is get a grocery list set for tomorrow. On the plus side, it’s under 4 weeks until I see Marco and Roger again — they will be visiting me and nearby New York City for about 10 days. As is usual for Dutch buildings, they are narrow and wedged in against one another. Reminds me of Amsterdam… with much less people milling around. Zondagen… Sundays. An apt day to post about churches. But first, I spent a remarkably short time at the Palisades mall again today — just long enough to pick up my engagement ring, which was successfully resized. I managed to get the same bus both ways, having arrived at 3:45 and getting back outside in time for the 4:10 route back out. While I was waiting at the bus stop to go back home, I heard a large rapping on the glass divider separating the different benches of the bus shelter. I looked over and it was a young child. He peered at me briefly, grinned, and then hid his face behind the metal framework in the middle. Ah, so it’s peek-a-boo you want. I quickly peered around the left edge. He grinned. I waited a moment and looked around the right edge. He laughed. We continued for a bit longer. Just a quick harmless game that reminds me of my own childhood, way back when. 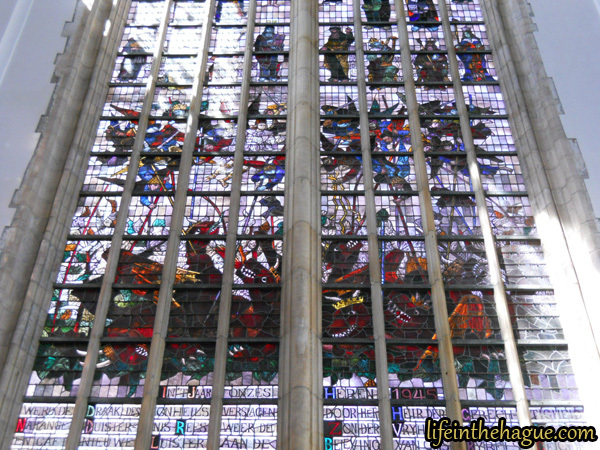 Another Delft site that we visited was Nieuwe Kerk, which began construction in 1396. It’s a Protestant church used as a burial site for many of the royal families. There was even a grave site there for a child who was born in May of 1822 and died in October of the same year. Imagine coming down the stairs from dinner, and seeing a French nobleman at the bottom. Someone who you thought was on your side – but was in reality pointing a pistol at your chest and shooting at close range, killing you. This was the fate of William the Silent, one of the leaders who revolted against the Spanish in the 16th century. He died after a reward was placed on his head and someone decided to track him down and kill him for it. 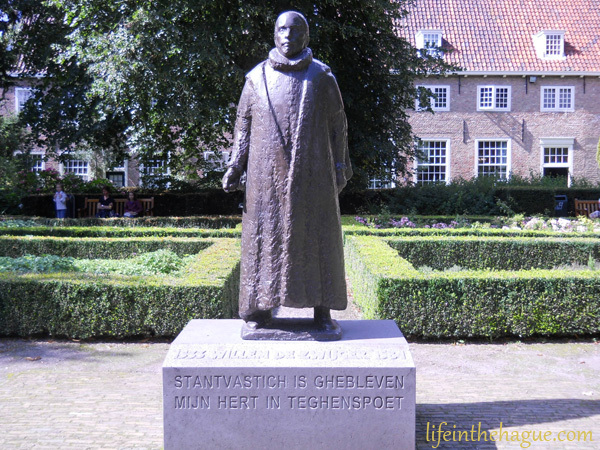 Another place that we visited in Delft was Prinsenhof, where William the Silent was assassinated. They turned his place of assassination into a museum, but I’ll leave that post for another day. For now, let’s just look at the beauty that awaits outside.